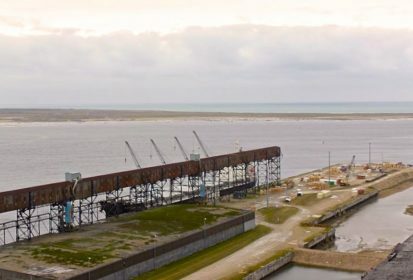 The grain industry player in a deal to restore and restart the Hudson Bay Railway and Port of Churchill has factored the port’s access to Arctic tidewater into its business plan. Regina-based pulse processor AGT Food and Ingredients is one of the members of the Arctic Gateway Group, which on Friday confirmed a deal to buy the railway, port and related assets from U.S. shortline rail operator OmniTrax. Financial details of the deal remain undisclosed. Among the three Arctic Gateway partners, Missinippi Rail LP — a partnership between Mathias Colomb Cree Nation, Fox Lake Cree Nation, Opaskwayak Cree Nation, Tataskweyak Cree Nation, War Lake First Nation, York Factory First Nation and municipalities along the rail line — gets a 50 per cent ownership stake in the group and “board appointments commensurate with this interest,” according to Grand Chief Arlen Dumas of the Assembly of Manitoba Chiefs. AGT and Toronto investment firm Fairfax Financial Holdings get the remaining minority stakes in the group. According to AGT, the group’s deal involves “multi-year contribution agreements” with the federal government to support the share purchase, repairs of the port and rail line. The deal also calls for Fairfax and AGT will operate the rail line and port facilities under a 99-year operating agreement, AGT said. “Though the investment isn’t material for AGT from a capital expenditure perspective, we feel the ability to add further port access is important for our long-term plan as the recovery of markets for Canadian agricultural products continues in the coming years,” AGT CEO Murad Al-Katib said in a release. Fairfax president Paul Rivett, on Arctic Gateway’s behalf, noted in a separate release that the deal calls for a “long-term support package through Western Diversification and Export Development Canada” to acquire the assets and implement its first phase. That phase, he said, will be “to repair the rail line (and) undertake safety and rehabilitation upgrades to the port and the railway assets to efficiently operate freight and passenger services to the northern communities and the port. The group, he said, has awarded a contract to Brandon, Man. rail services company Cando Rail and Alberta soil stabilization and ground reinforcement firm Paradox Access Solutions to get repairs underway. “We are racing against time to attempt to restore services prior to the winter season,” he added. The Hudson Bay Railway, which runs from the northwestern Manitoba communities of The Pas and Flin Flon northeast through Thompson to Churchill, hasn’t operated since May 2017, following flooding and washouts along the stretch between Amery and Churchill. The rail line, completed in 1929, and the port facility, built by 1931, were set up to serve northern communities and provide an alternate shipping route into and out of Western and central Canada. Denver-based OmniTrax had bought the government-owned port and Canadian National Railway’s (CN) rail line in 1997. From an export perspective, railing grain from certain areas of Saskatchewan and Manitoba up and out through Churchill, rather than east to Thunder Bay, is believed to shave up to three days off voyages to some ports in Western Europe. But Churchill’s grain handle declined in the five years after the deregulation of its main customer, the Canadian Wheat Board. OmniTrax shut down the port facility and laid off its staff before the 2016 grain shipping season.